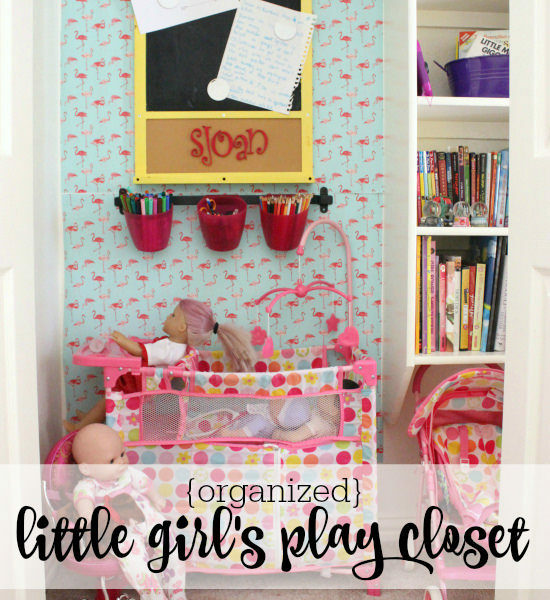 Project Little Miss | Study Nook Plans | hi Sugarplum! 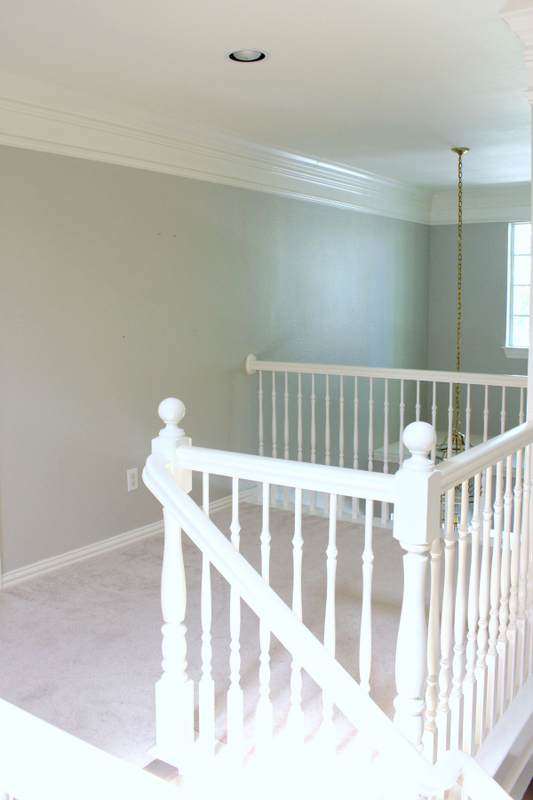 The progress in Little Miss’s Room has been slow and steady…pretty much like the rest of the house…but I’m determined to finish her sweet space this Summer. Or at the very least, the homework/creative zone. She’s entering her final year of elementary school #insertuglycry so it’s time she had a dedicated spot that allows her to focus on her work…but also be a special area to cultivate her creativity. The original room plans called for the desk to be in her room, but Santa had other plans when he brought the world’s largest Barbie house this past Christmas. It now occupies the only free wall space in her room, so we’ve decided to utilize the little zone just outside her room for now. 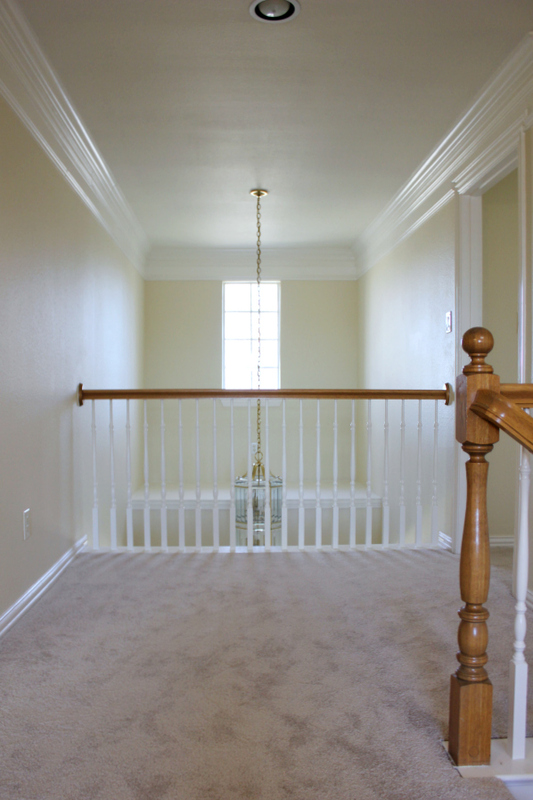 The little nook has actually already undergone a mini-makeover of it’s own…here it is on closing day with yellow walls, and honey oak railings. 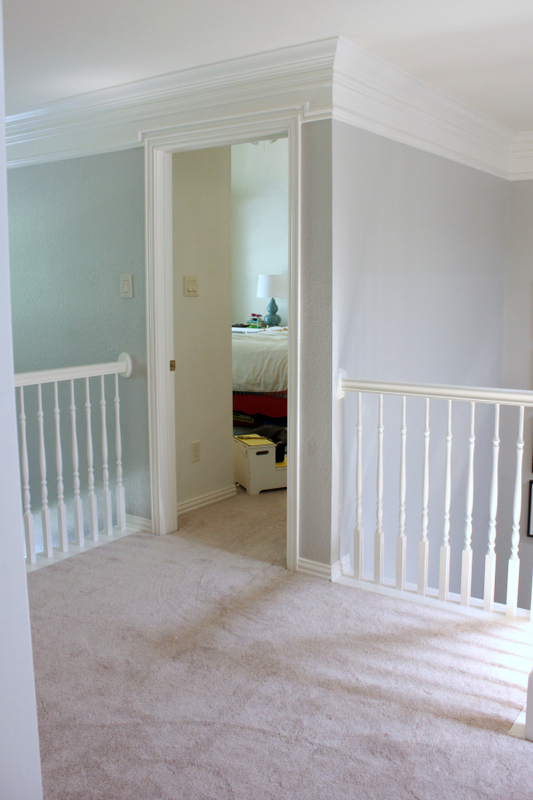 The opening on the left leads to our son’s room, and door on right is Little Miss’s room. And here it is today (after a major toy declutter…seems she’d already claimed the space as her own! 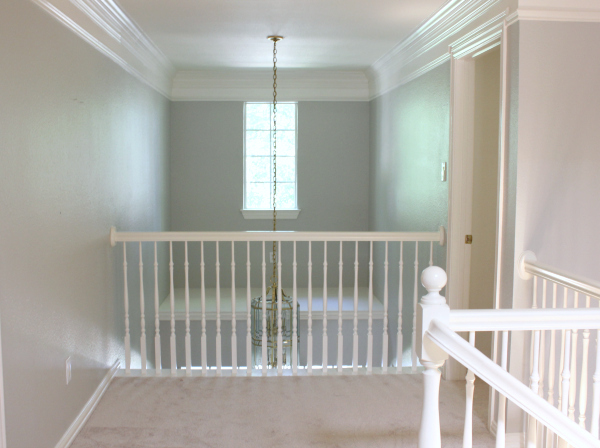 ), with freshly painted banisters and rails. 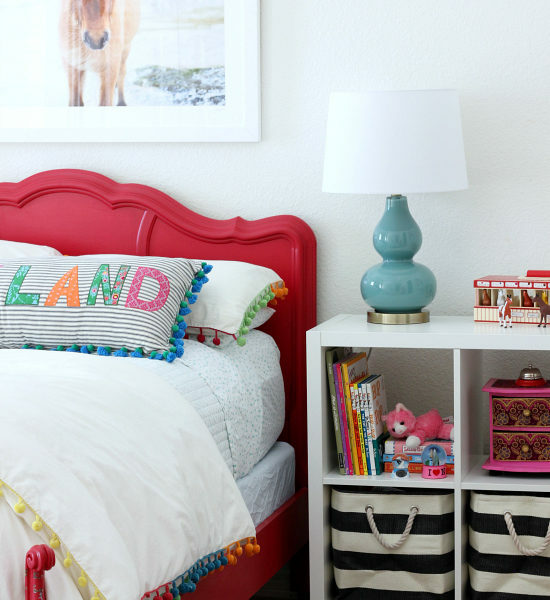 I partnered with Target’s new kids decor line, PillowFort, to design the colorful space. The products are stylish, fun, and extremely affordable…and we are cuckoo for virtually every piece! I love the whimsical prints and fresh color palette, and it’s chic enough to fit seamlessly with the rest of the home. I think it will also easily transition as she grows, too. This is what we’ve got in mind right now, but she’s hoping the teepee finds it’s way in the mix, too. I’m hoping this whimsical space will encourage her creative streak, but also take some of the dread out of homework! We’ve been working on it together for the past few weeks, so fingers-crossed we’ll be sharing it soon. Do your kids have a dedicated homework/creative area? Any tips for things we should include to make the space more appealing to her? I have set up study spaces for my kids…4 of the 5 were in middle school last year, and I survived…but found them always gravitating toward the dining room table, the kitchen table or the kitchen island. My one daughter actually converted hers into a makeup vanity. Fine with me…at least it gets use. I love the idea of a desk for each kid, but at least in my house, it's not practical/functional!! I love the new Target line! 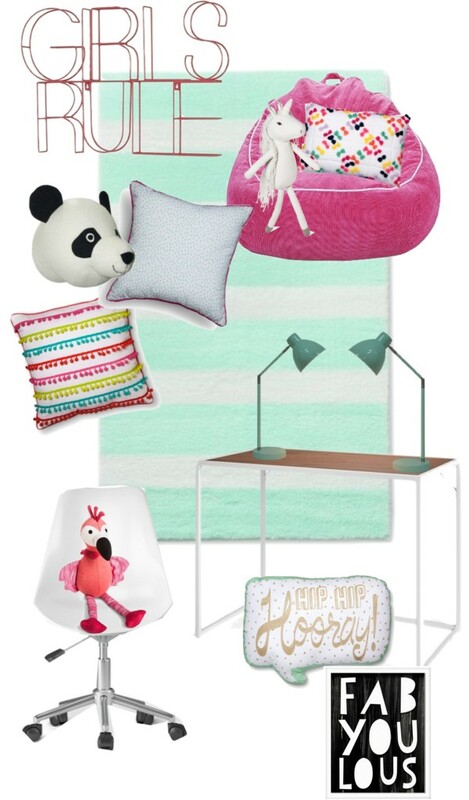 I used the Zebra head in my daughter's nursery and it is so cute and fun! Can't wait to see how your daughters nook turns out! Don't you just LOVE Target? The new PillowFort line makes me wish I had a little girl whose room I could decorate – sigh. I even went as far as purchasing a quilt and several accessories (including that lamp in PINK) for my guest room, but I think it was going to end up looking a little too juvenile, so I took it all back, sadly. Although I did keep the pink lamp! Anyway, to the question at hand – will you be giving any thought to storage/organizing? Target has some great storage cubes, very similar to the Ikea Kallax line. They also have PillowFort storage bins that fit in the cube cubbies; they would coordinate nicely with what you have chosen so far. Or one of Ikea's small white Billy bookcases? They have some great sizes, they are compact, come in white, and are quite affordable. Whatever you do, I know it will be adorable! Can't wait to see it all finished. p.s. 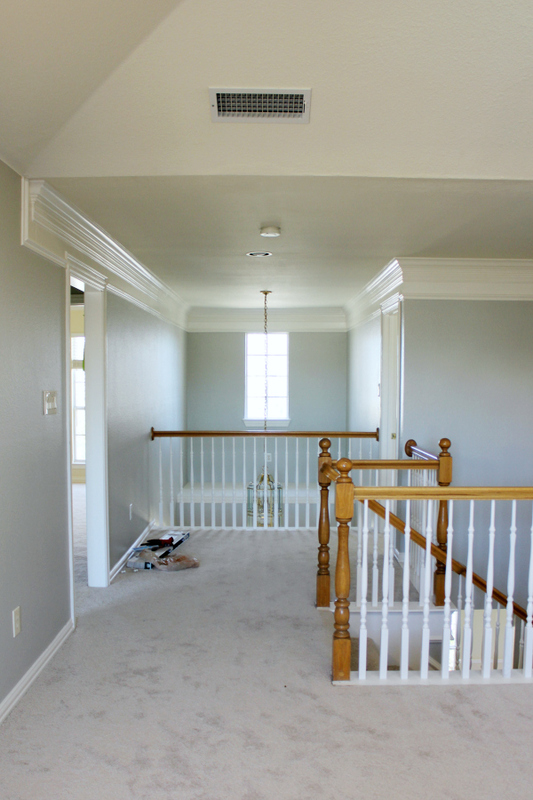 Did you paint your stair railings yourself? They look great! I've been wanting to do that for years – you may have given me just the little nudge I've been needing. Must be a 10 year old thing-we are working on an "older girl" room for my daughter with the same idea of making a study spot. (We too, got the giant Barbie house for Christmas but she agreed to move it to the basement. 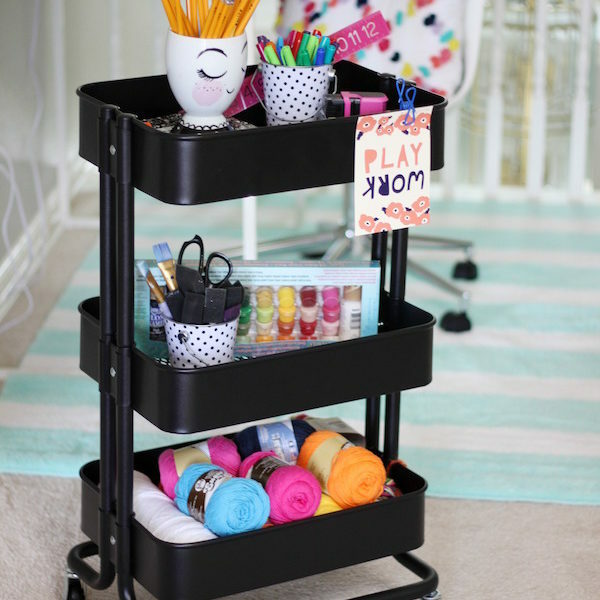 :0) I love this line and have already purchased a lamp and storage baskets for her new room. I actually prefer my kids not to have private study areas. I am a high school teacher, so I know all the tricks kids use to get out of homework while they're actually on Facebook or watching Netflix! I want my kids where I can see what they're up to! However, I love all your picks for your daughter's space. So cute! Time to go to Target!